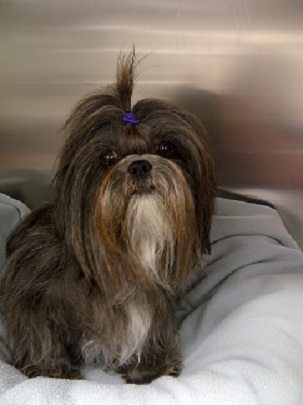 Meet Savannah: she is a 5 year old Shih Tzu who lives life on the road! Her “mom” is a long-haul trucker and takes Savannah and her two other dogs everywhere she goes. On a recent road trip, Savannah’s appetite had decreased steadily until she wouldn’t eat at all. Savannah’s mom became quite concerned so she stopped midway through her trip to see us at Ellwood Park. When Dr. Engle examined her, Savannah was lethargic and seriously dehydrated. Dr. Engle started IV fluid therapy to help replace her lost fluids, and blood tests to determine the source of Savannah’s illness. Her blood contained low sodium, low chloride and high potassium. We performed an “ACTH Stimulation Test” and confirmed that Savannah had developed classic Addison’s Disease. 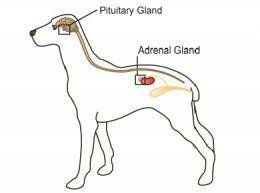 In animals and people with Addison’s Disease (hypoadrenocorticism), there is a failure of the adrenal glands to produce two VERY important hormones: mineralocorticoids and glucocorticoids. Without these hormones, patients develop hypotension, hypoglycemia, weakness and collapse. Untreated, Addison’s disease eventually becomes fatal. 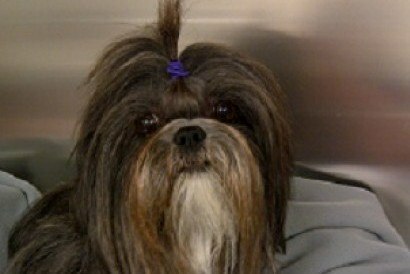 Fortunately for Savannah, her owner brought her to us before her condition became life threatening. Her electrolytes were corrected with more IV fluids, and hormone replacement with fludrocortisone and prednisone were instituted. Her recovery was quick and soon she was eating 3 meals daily! She will now be on lifetime medication to treat her Addison’s Disease, but with close monitoring she will live a long and happy life! Savannah : "I know I'm cute, get over it."